Thom tagged me but I'd say this post is more than that! This is rather a serendipity post for me and I will slowly explain to you why. 3) Post that photo along with the story behind it. This is the 6th photo in my 6th photo folder! What a luck as this photo will let me do my (not) WORDful (less) Wednesday and the story behind it will let me join What's Cooking Wednesday for the first time! This photo was taken very recently...just last weekend. This is IT Guy's recipe and I'm sure he'll be surprise to see it here...Ha! 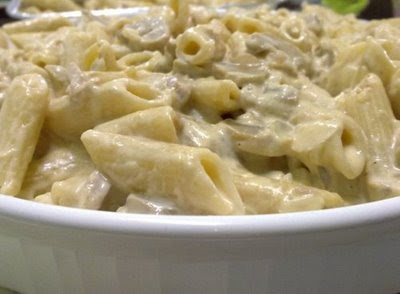 I call this recipe Creamy Tuna Pasta as that is what it is! Most of my friends and my family love it and this is a good recipe for weekends and a good step away from the usual Spaghetti Bolognese (Which is so common to Filipinos!). At least for us. Boil the water, add a little oil so as not to make the pasta stick to each other. Add a little salt for the pasta. Once the water is boiling add the pasta until al dente (in English until it reached its tender crisp phase)! Drain and toss! *If there is one thing I learn from the IT Guy it is to read the instructions in the package of the pasta as cooking time varies for each kind. 2. Add the olive oil into a large fry pan over medium heat. Add garlic. Don't over cook it as it will give a bitter taste. Just enough to get its aroma. Then add the onions and the mushrooms. 4. Add the cream. Season to taste. We love to add a little of white pepper. Let it stay for 2-3 minutes while continuously stirring it. 5. Then add the pasta. Mix. *You may also serve it with sprinkled chopped flat-leaf parsley. For more interesting photos, you may visit Wordless Wednesday and Wordful Wednesday...or go to The Fairy Blogmother for more What's Cooking Wednesday participants. Mariposa, when will you invite me for dinner? I love tuna casserole or tuna pasta or tuna sandwiches, even! That looks delicious!! I want some! Yummy I havn't made tuna casserole in a long time! Okay, this looks delicious! I am definetely going to give this recipe a try soon...I love tuna noodle casserole and this looks like it's one step better! Ang sarap naman..:) Thanks for sharing the recipe. Will try this soon. That tuna pasta recipe is great. We almost always have those things on hand so I could easily make it. That looks and sounds good! I love tuna pasta and this looks delicious! that looks so delicious! my family can't stand tuna casserole of any sort and i would love to eat it all right up! Umm, I am so making this TOMORROW!!! Seriously, it looks delicious!! Thanks for sharing! that looks DIVINE!!! thanks for stopping by! My husband makes something just like this and is it good? He also puts mushrooms in it. I can't remember if I just read that you do too. Wow, is that a senior moment or what? I going to try this. I'm on a low fat diet, so will substitute with fat free evaporated milk instead of the cream. I've used evaporated milk before and it's very good. Welcome to What's Cooking Wednesday. Thanks for sharing your recipe. This looks great. I know my husband would love it. To think I almost missed your first WCW post! This dish is SO similar to something that my mom made growing up. We call it tuna noodle casserole, although there are many manifestations of it.